Despite a slow season for the Quinnipiac baseball team, a flock of scouts can be seen every Friday afternoon at the Quinnipiac baseball field. They stand behind home plate, glancing at their notes while checking their radar guns after every pitch the senior right-handed pitcher delivers smacks against the leather of the catcher’s glove. Derek Lamacchia knows that the scouts are there to watch him and only him. He knows that he has a shot to be drafted by a professional team this June in the Major League Baseball Draft. But he understands that he has come a long way since playing varsity high school baseball at Holy Cross in New York. Despite only pitching 13 innings in high school, totaling 21 strikeouts, walking just three batters and hosting a sub-2.00 ERA, summer coaches came to the 6-foot-3 right-hander and suggested that his future may lie in pitching. He went to several summer showcases, including a showcase at the Long Island Ducks’ facility where he met Quinnipiac baseball head coach Dan Gooley as a junior in high school. After moving on to Quinnipiac to pitch at the collegiate level, Lamacchia struggled during his freshman year, totalling an 8.92 ERA, allowing 35 runs on 49 hits in just 35 1/3 innings. Lamacchia has improved each year since his freshman season, notably striking out 65 in 61 2/3 innings during his junior year, crediting his success to the development of his secondary pitches. As Lamacchia developed what he calls a “plus-fastball” and a curveball to which he is comfortable using, it has taken him some time to develop his change-up. 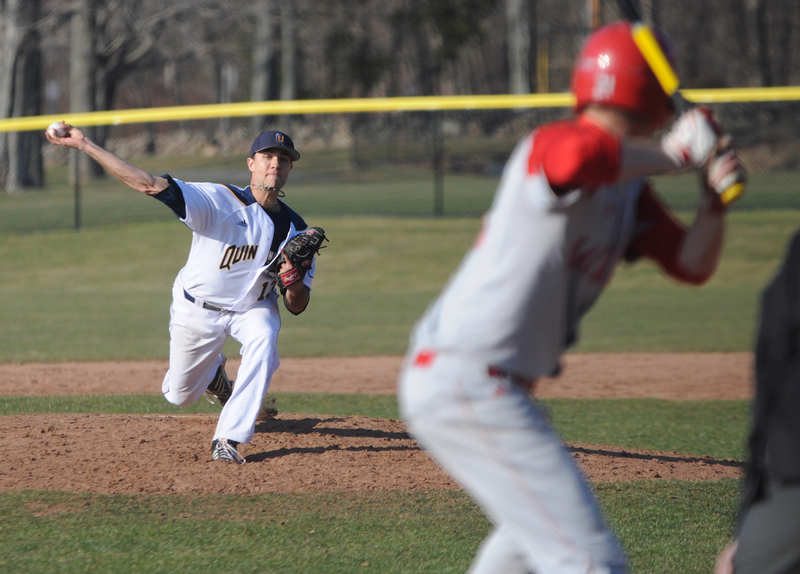 In a meeting with the Quinnipiac ace following last season, Gooley stressed the importance of using a change-up. Lamacchia knows, too, that this only makes him more dynamic. Although Lamacchia has struggled to pick up the winning decision in games throughout his collegiate career, he knows that the game isn’t entirely in his hands but at the same time doesn’t let losing affect his mindset. Focus and determination are key attributes that drive Lamacchia to improve each time he puts on his spikes, regardless of whether he is shagging fly balls in the outfield during practice or facing the opponent’s top hitter in a bases-loaded jam. Either way, the senior always looks to help out the younger players, even if he comes off as quirky. With major league scouts present at every game that Lamacchia pitches in, there are always rumors and expectations from some that he could be the first Quinnipiac player to reach the Big Leagues since Turk Wendell in 1993. But for Lamacchia, ignoring the critics allows for him to focus on the task at hand; off the field, he understands that every little detail is being watched from a scout’s perspective. Draft-status aside, Derek Lamacchia will continue to prepare for each start with the same ethic that has gotten him to where he is today.